When Haydn receives a request from his friend Kaspar to evaluate a collection of scores reputed to be the long-lost operas of Monteverdi, he’s intrigued. Until he receives a similar request from the Empress Maria Theresa. Skeptical of the value of Kaspar’s bequest, Haydn nevertheless offers to help. But before he can evaluate the music, Kaspar is murdered—brutally beaten and left to die in front of a wine tavern. Nupur, how did you get started writing? I’ve always enjoyed writing and started at a young age, but I wouldn’t have considered writing novels if I hadn’t undertaken the enormous project of a Ph.D. dissertation. I figured if I could do that, I could also write a novel. The inciting incident, if you will, was Susan Wittig Albert’s note in one of her Beatrix Potter Mysteries. Reading about the research she’d undertaken for the Beatrix Potter novels made me feel this was something I could do. I’d just come out of a Ph.D. program, and having worked as a journalist prior to that, I was quite comfortable with the idea of research. Reviewing the research literature in your topic is essential preparation to beginning a project. And in some ways, writing a historical mystery is no different. Researching the time period and my characters is essential preparation for writing the novel. Love it. Do you write every day? No. But that’s not to say that I don’t work on a project every day. 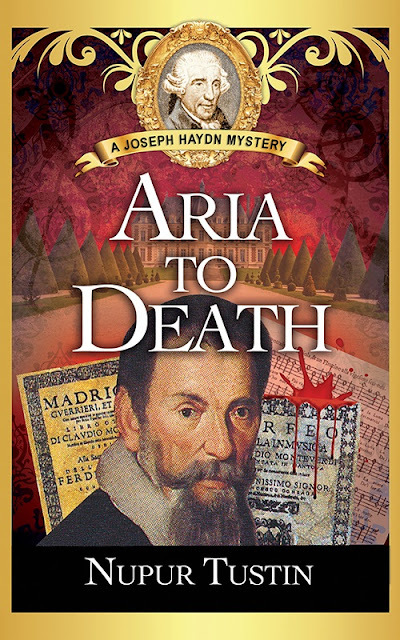 Before I began writing Aria to Death, I had to research Monteverdi’s life, get to know him as a composer, learn about his theatrical works and the works that were lost. I also had to learn about the process of music authentication. I may write a blog post—and that involves reviewing the research as well. Or I may send out a newsletter. There are times—as now—when I’m planning a project, outlining story ideas for instance. All of these different tasks are an essential part of being a writer. What do you think is the hardest aspect of writing a book? Making decisions about where the story will go or how it should be told. I can think of a dozen different paths a story can follow. But which one is the best? I can think of several different ways a story can be told. I often write several different versions of a scene. For one scene in Aria, I wrote six different versions and was practically in tears because I couldn’t figure out which one to go with. I was sleep-deprived and frazzled—I’d just had my third child. Eventually, my husband helped me cobble together a final version from the six different ones I’d written. He waited until I’d written it out and read it over to make sure I’d covered everything I needed to. I know I can’t say both, but unfortunately, this isn’t a straightforward either-or question. Mysteries and thrillers frequently turn upon plot. Our characters don’t ask to find bodies in their libraries or to be wrongfully accused of murder. And obviously the plot twists and turns are what keep the reader turning the pages. Having said that, the way a plot event plays out is entirely dependent upon the characters’ response. Without believable characters, the best of plots will fall flat. It’s our characters’ quirks and the strange ways they respond to events that keep the plot moving. All the time. As a writer of historical mysteries set in eighteenth-century Austria, I find myself reading more nonfiction than fiction these days. There are innumerable details that I need to ensure my novels come alive. Immersing myself in Haydn’s time provides me with those details as well as with plot ideas. I also read books about forensics and the criminal mind. Understanding criminal behavior is key to writing a compelling mystery, and I think that this is work every mystery writer needs to put in. I like to think of myself as a versatile writer. My Haydn Mysteries are written in eighteenth-century voice. But I’ve also written stories set in contemporary California, and I pride myself on being able to use a contemporary, even a blue-collar, idiom. You definitely need an intriguing situation: the kind that makes you wonder how one would respond under those circumstances. But you also need a character worthy of taking up the challenge inherent in the situation—a character who will make the most challenging or the most interesting choice. In terms of novels, there are two books so far in the Haydn Series. A Minor Deception is the first in the series and Aria to Death is the second. There’s a Haydn short story. “The Baker’s Boy,” in Kaye George’s eclipse-centered anthology, Day of the Dark. A second Haydn story, “Whiff of Murder” is available to my subscribers when they sign up. And there are a couple of short stories published on Amazon. One of them, “Mrs. 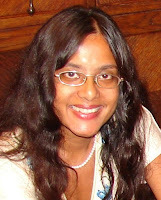 Sutton’s Project,” was initially published in Mystery Weekly Magazine. I’m not sure they’re so very secret. I compose music, and I enjoy drawing. I’m fairly good at both. I’m also a pretty good cook. I don’t spend a lot of time on it, but I enjoy it when I do. It’s like walking into a room full of writers. There are all sorts of conversations about the kinds of things that only writers will talk about: procrastination, characters who refuse to get killed, plot problems as well as the wonderful reader reviews we get or our beautiful covers. What five things would you never want to live without? My laptop and my iPad. I use both to write. I also use my laptop to teach my kids phonics and reading. “Word work,” we call it. I don’t think I could write an entire novel by hand. I love my Weber upright. It has a beautiful sound and I enjoy playing it. Then there’s my owl mug. It was a gift from my husband and it makes me happy as does the raspberry black tea I drink in it. If I had to do without that tea, I’d be really unhappy! I also need my books. My research as well as several good mysteries. So, I suppose when it comes down to it, I need more than five things to lead a happy, fulfilled existence. My library card. I enjoy going on long walks, and there are two or three libraries close by. I love dropping in to see what I can find. And when I can sneak in without the kids, I can check out a book or two for myself. Without question, the weather. I also like the fact that there are libraries close by. And it’s nice to live in a multi-ethnic, vibrant city like Los Angeles. I think it’s a toss-up between Detective Murdoch—I feel quite sure it’s because of Maureen Jennings’ involvement that the television series is as incredible as it is—and Father Brown. I love Murdoch’s dedication to science and logic and his ingenuity, not just when it comes to solving mysteries, but in coming up with the most fascinating inventions. But Father Brown is just so endearing. Just the kind of person we all need in our lives. Since my books are set in Austria, schnitzel, I suppose. I do have a recipe for it in one of Bon Appetits, but I haven’t had the courage to try it out yet. I especially love “Don’t Let Go,” the duet Sarah McLachlan and Bryan Adams sing together. I remember listening to it in the hospital while I was waiting for my daughter to be born. “Don’t let go of the things you believe in.” I think that’s a beautiful line and one that every writer should take to heart. Don’t let go of your dreams and of the stories in your head. Because it’s about a musician and because it offers a theory that’s psychologically very compelling, I’d have to say Immortal Beloved. It’s about the mysterious woman Beethoven referred to as his immortal beloved. He leaves few clues as to her identity, and the theory that the movie posits is one that has no basis in reality. But it’s so intriguing you can’t help digging deeper into the topic. And that’s exactly what a good historical mystery should do—get you so fascinated that you want to find out more. Anne Perry does that in her mystery about Jack the Ripper and Jeffrey Deaver achieves the same effect in his historical thriller, Garden of Beasts. I’m researching Prussian Counterpoint which is set in Potsdam, not far from Berlin. Haydn has to pit his wits against the wily Frederick of Prussia, but he also gets to meet a man he regarded as his mentor, C.P.E. Bach, the son of Johann Sebastian Bach. Haydn never did get to meet CPE in person. On his way back from London, he traveled through Hamburg only to learn that the older musician had passed away.